Tradition defines Carnegie Mellon University's annual Spring Carnival. Each year, as spring semester draws to a close, CMU erects a Ferris wheel that rivals the height of "Walking to the Sky," screaming students line Frew Street urging Buggy pushers to run faster than ever, and tiny MoBots weave down a meandering white line next to Wean Hall. On the Cut, it's not hard to find a dean or police officer getting soaked for charity. 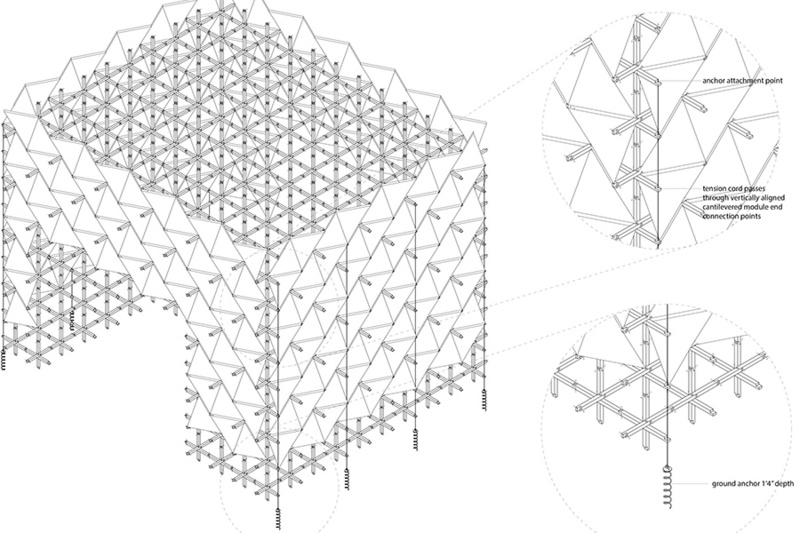 This year, a group of 50 School of Architecture students designed a new tradition. They've built this year's official Carnival entryway. Three undergraduate students led the school effort, Pavilion Committee chairs Ghalya Alsanea, Ryu Kondrup and Eddie Fischer. 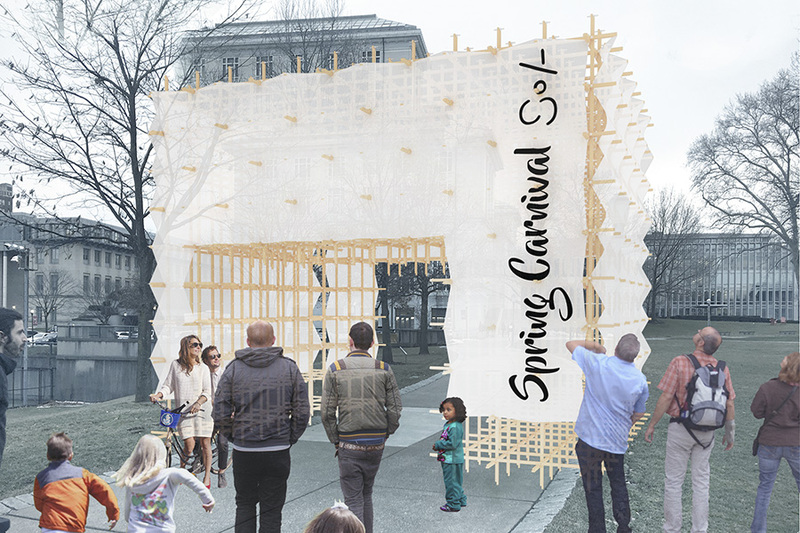 "Our goal is to have a presence for the School of Architecture by representing ourselves and our abilities well at Carnival," Fischer said. "It's rewarding to get to build something the whole university is going to get to experience." Fischer describes himself as a meticulous person, one that takes great pleasure from creating things. And one thing's certain, the effort to bring the project to fruition was meticulous. The final archway is the result of hundreds of hours of effort. In the final build week, groups of students worked up to eight-hour sessions to construct the 16-foot-tall rectangular arch made up of wooden, three-axis modules. Ghalya Alsanea, a fourth-year student in the five-year program, wasn't sure the industry was right for her before coming to Carnegie Mellon, but a scholarship encouraged her to give it a try. She fell in love with the interdisciplinary nature of the field, something she brings to this project. "To have this project go from an idea to an actualization is priceless," Alsanea said. "The theme for this year's Carnival is 'Planet Earth.' The archway was created to be sustainable. It can be disassembled and reassembled to be reused later on. 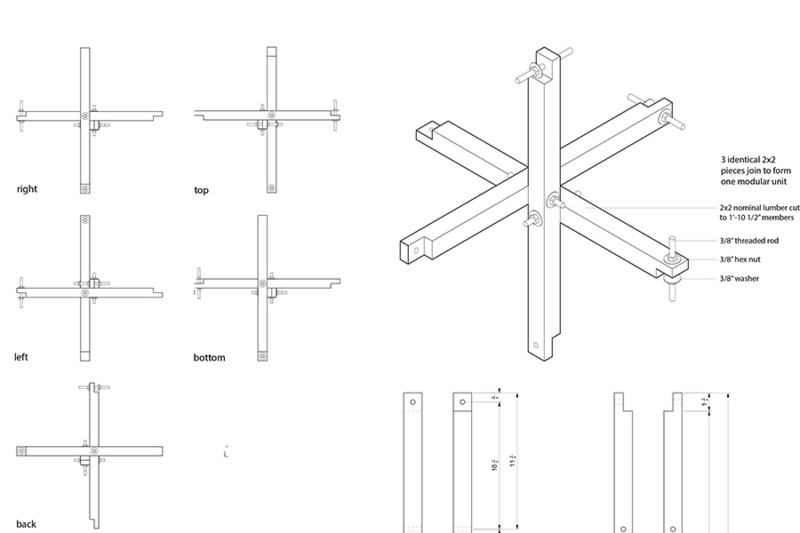 The pieces can be used to create tables or chairs." Ryu Kondrup, who is in his third year in the program, appreciated the chance to work on the project. "For architecture students to have the ability to physically build something rather than produce drawings for review is a great opportunity," Kondrup said. The School of Architecture students created detailed plans before constructing the Archway.